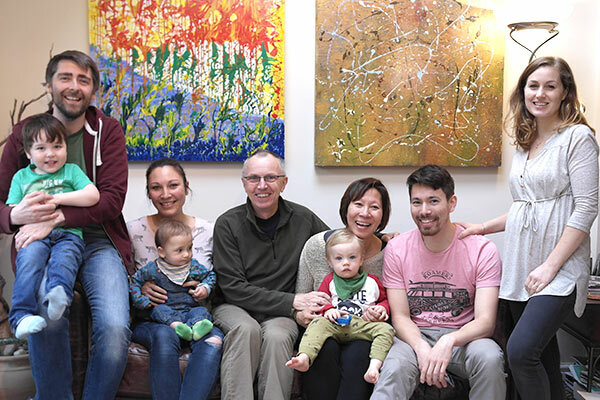 Ken Bromley Art Supplies is a family business in the true sense of the word - currently there are two generations of Bromley's working in the business with a third coming up the ranks - well in the school holidays anyway! 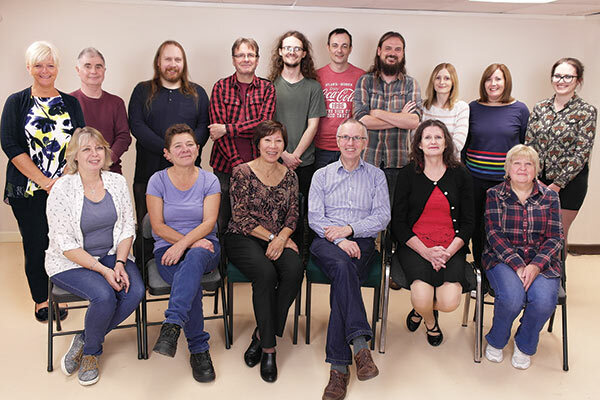 Meet the family, Andrew, Laureen, Richard, Melinda, Michael and Iris all work for the company. Based in Bolton, England, Ken Bromley Art Supplies came about as a result of the popularity of the famous Ken Bromley Perfect Paper Stretcher. 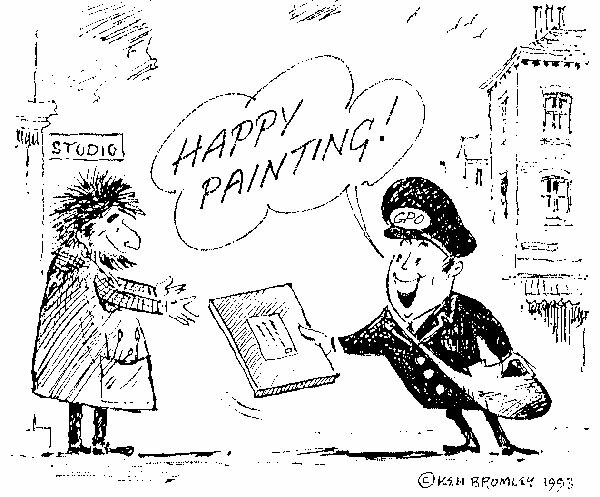 In 1993, in response to feedback from artists who had bought the stretcher board, we began to supply watercolour paper for use with the board, a service we called 'Paper by Post'. The success of this service lead us to expand our product range to include paints, brushes and accessories. Since then, we have continued to build and improve both our product range and our service and this is something we continue to do to this day. 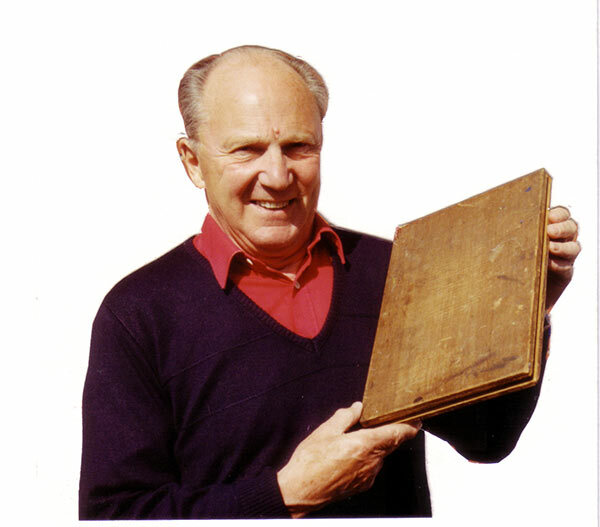 Ken with his original paper stretcher 1993 - our paper by post logo One of our early catalogues - issue 8. Yes! you did used to order your paints from a list of colours printed in a two colour catalogue! When we first started we were operating out of a couple of rooms above a travel agency - taking parcels down to the local post office to send out. Since then we have had two more moves: to an old green grocers shop and then a boys brigade building, before we settled in our current warehouse which we have recently expanded with a mezzanine level to provide more room for our ever expanding stock lines! As a family business, we pride ourselves on being able to offer that personal touch - if you contact us, it might just be one of the family taking the call or replying to your email - we are all very much hands on in all aspects of the business. Our aim is to continue growing whilst maintaining the friendliness and excellent service we are known for. When employing our staff we look for people who can carry on our business ethos and provide you with the same service that we would ourselves. Most of our staff are practising artists or have an interest in art, and are enthusiastic about the products we sell. It also means they are able to offer advice and recommendations when required. Located in Horwich, Bolton we moved to our new warehouse in 2011. We also have a small shop attached to the warehouse where you can come and browse and even try some of the materials we have on offer. We aim to give our customers more than they expect, top quality products, fast and friendly service, discount prices, well packaged goods and reliable service. We aim to service our customers to the best of our ability, answering questions, increasing our product range as needed and continually locating good purchasing deals in order to provide special offers at even better prices. We are based in Horwich, Bolton, situated 15 miles northwest of Manchester, England. 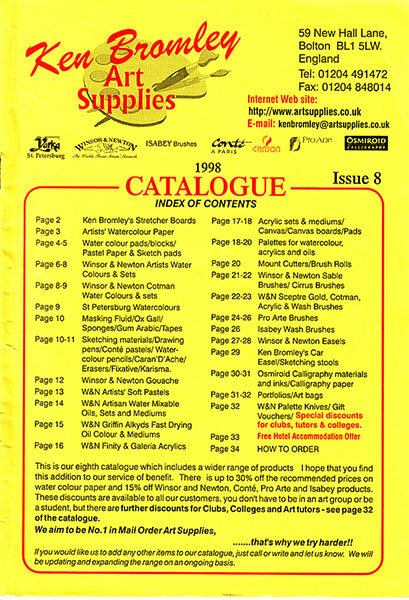 The contents of this web site produced by Ken Bromley Art Supplies is protected by copyright. Any photographs, logos, artwork or copy owned by Ken Bromley Art Supplies may not be used without permission in writing.